The world of today is increasingly digital, which makes IT operations all the more vital to the continued success of any business, regardless of its size and industry. IT’s value proposition is largely shaped by its operational efficiency, that one intangible metric that is essential to reaching the desired level of IT operational maturity. However, understanding what you need to achieve and actually implementing the right strategies, practices, and IT management applications that will help you remain competitive in this digital landscape are two different things. More hardware power doesn’t cut it anymore as the majority of business processes are driven by data and data analytics. In light of these digital transformation challenges, businesses need to adapt, improve, and foster the IT infrastructure and operations to move forward. Here is a closer look at solutions that can help you improve your IT operations. In a nutshell, log data contains virtual trails left by users and trackers, which makes log management the industry standard for auditing activity on any IT network. As such, a log management tool is a necessity, particularly when there are dozens of servers located on different data centers and time is critical. One of the leading tools in that area is XpoLog, allowing efficient automation of the entire log management lifecycle, from collection and parsing to analysis, monitoring, and problem discovery. The tool itself is fairly modular and customisable, with numerous out of the box analytic apps and predefined dashboards and reports, along with the option to create dashboards and apps according to your needs. Thanks to real-time log monitoring and AI-powered analytics insights, it’s very easy to see activities across servers and recognise patterns or behaviours across multiple logs without the need to login into multiple servers. You can also view and analyse multiple logs from multiple remote data sources, identify data patterns from a variety of sources and then create corresponding log data patterns for eﬃcient system use. More than a decade-long experience makes XpoLog one of the more recognisable and favourable solutions for big data analysis in ITOA (IT Operations Analytics), cybersecurity, compliance and regulations, cloud/hybrid cloud management, and more. Information Technology Services Management (ITSM) has been in flux for the past few years, largely influenced by trends such as DevOps, self-service offerings, and the everlasting digital transformation of businesses. As ITSM-based models continue to expand, they allow users to control their IT experience by both aligning and integrating technology into the business. SysAid is one of those helpful ITSM solutions that provides comprehensive control of various IT operations. Key features include help desk automation, asset and patch management, as well as reporting and performance analysis with customisable dashboards. SysAid can also be deployed on-premise and has many add-on modules to further enhance its functionality. In terms of ITSM, there is incident management, problem and change management. These allow users to enhance the efficiency of the service desk by automating its processes, systemising problem management workflow, and improve control and the management of change requests, including the changes themselves. There’s also network discovery and IT asset management that covers MDM (mobile device management), and a myriad of self-service-aligned features like the end-user self-service portal, automated password reset, mobile apps, chat, IT industry benchmarking, and advanced workflow and automation features. The fact is that the entire IT ecosystem is constantly fluctuating: the number of servers, their names, application components and a myriad of different elements are changing according to system restrictions. There’s plenty of raw data available but not enough insights into the actual relevance and meaning behind it. 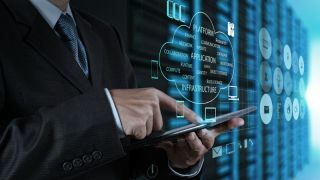 As IT Operations Management (ITOM) and ITSM continue to blend together in order to provide a more encompassing view of IT, so do SaaS solutions merge the best of both worlds into one package. Axios Systems and their assyst platforms are one such example of a well-blended mix of ITOM, ITSM, and ITBM (IT Business Management) functionality. The foremost strength of assyst is the automation or application development on a service, system, and employee level, empowered by a service-view configuration management database (CMDB). This is the core of assyst that stores all kinds of information that ultimately enables IT to function faster and more efficiently. The available integrations provide centralised control over a customisable dashboard and allow the creation of various automation routines to streamline business processes such as service desk, project management, incident management, and so on. Almost every aspect of ITIL (Information Technology Infrastructure Library) is covered, which makes this solution a fit for every type of organisation that is looking to achieve service hierarchy in an ITIL-aligned process. The subject of cybersecurity and threat detection will always be a hot topic in the online world. Hence, it shouldn’t be surprising that SIEM (Security Information and Event Management) has established itself as a critical piece of modern organisation’s cybersecurity policy, and LogRhythm SIEM stands for one of the most valued platforms in this field. This is as close to an enterprise-grade SIEM tool as it can get that’s equally well-suited for small and mid-sized organisations looking to implement new security measures with their existing threat intelligence and analytics functionality. As the IT landscape gets more complex, it only emphasizes the fact that there is no one-size-fits-all approach when it comes to maturing your IT operational efficiency. In addition, no particular approach is better than the other, meaning you might need to combine multiple new and existing solutions to achieve the desired results. After all, efficient IT operations are the key to sustaining success. In a landscape that’s shifting every once in a while, the ongoing challenge is to achieve more with less. The key is to identify areas where existing infrastructure in terms of hardware and systems can be leveraged, as well as where new solutions are required. That would be the best approximation of which direction your business should take.